Our Wolfgang Vacation Cabin awaits you! 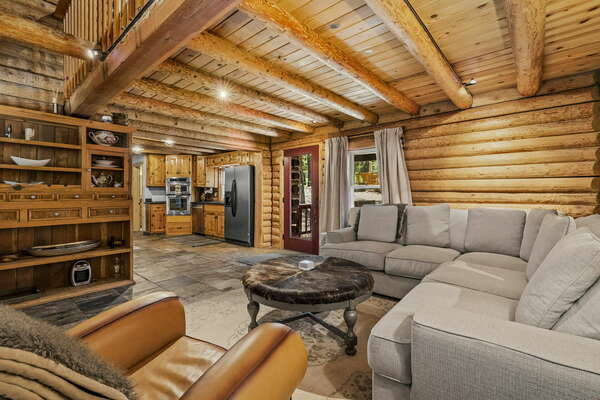 This cozy cabin has 3 bedrooms, 2 bathrooms and opens up to a beautiful living room with high vaulted ceilings and views of Tahoe Donner Ski Hill, and within walking distance to Alder Creek Café, Equestrian Center and Tahoe Donner Cross Country Skiing, this beautiful place is sure to become a favorite. All 3 bedrooms are located on the same floor as the living area, just off of the living room you’ll find a big deck that can be accessed through the 2 sliding doors, have your dinner on the deck or enjoy a cozy evening by the fireplace. There is also a deck in the back of the house that can be accessed through the master, the perfect set-up for a winter or summer getaway! Tahoe Donner Ski resort is only 3 minutes away, the club house is about 5 minutes away, Northstar and Squaw Valley within 20 minutes drive and plenty of hiking, biking and just walking. Our Wolfgang Vacation Cabin is a great property to spend your summer as well as your winter vacations, Tahoe Donner Association gives you access to the clubhouse that has 2 swimming pools (a heated lap pool open year round and a big pool open in summer only), 3 hot tubs, 2 saunas, a cardio and a weight room. There is also a golf course and tennis courts only a few minutes drive from the house as well as a private association beach on the east end of Donner Lake. Tahoe Donner has a ski resort as well that's available for your enjoyment, especially great if you have children. You won't even need to leave the area because of all the great activities offered including 2 restaurants, hiking and biking trails just as you walk out your front door, enjoy our private vacation home as much as we do. We recommend a 4WD or AWD when traveling to Tahoe in the winter, chains are a requirement. Please note, this property has a steep driveway so a 4WD or a AWD is a must! We're a local company with local staff that lives just a few minutes away from your vacation home, you'll receive a local number to call or text during your stay and someone is always there to assist.